Mega Man Legacy Collection arrives soon on the PS4, Xbox One and PC, and Capcom has now given a little clarity to its 'Winter' release window for the 3DS version. It'll arrive on the portable in early 2016 - as a download and a physical retail title - so we can take this off our potential Holiday 2015 line-up. Capcom is still holding off giving specific details on the 3DS version, though it'll hopefully deliver the same core features as the HD versions. The upcoming arrival includes the six core NES entries, while extras include a Challenge Remix mode that presents scenarios to test veterans but also help newcomers get familiar with the mechanics. A "Museum of the era" will include "hundreds of high-resolution scans of vintage concept sketches, production art, unused Robot Master designs, a database of enemy information", while a music player will have soundtracks for all the games. In addition it'll be possible to set times with online leaderboards and watch videos of others' runs. Hopefully the 3DS version will be fully featured, and we'll likely learn more at the end of 2015 or early 2016. Thank goodness I still have Anniversary Collection for the 'Cube. I guess it's cool for those who haven't given the Blue Bomber a go but I probably won't go for this. I already have all six games via virtual console after all. This would have made more sense to be featured on the Wii U. All six games are already on 3DS. Can't wait for this. Maybe I'm stuck in my old ways, but I feel more compelled to buy an XBox One because it keeps getting all of the cool retro compilations (Rare Replay, this, etc.) and the Wii U gets excluded. @Royalblues Amen. Who seriously buys these games 10x over? Dissapointing, I doubt I will get it around launch now. Which'll perform better, Mega Man Legacy Collection, or Mighty No. 9? @XCWarrior All 6 games plus 7&8 with two extras? And they want us to buy this too? Nah, chill out with that Capcom. But I can see why they did it. Those games need to be on this current gen's consoles. I imagine they're charging more than 10 USD for this, which is downright insane imo. Give me a Mega Man X collection that includes 7 and 8 and I'll be a happy man. I was wondering why you'd need this with all the games being on the VC already, but all the little extras sound nice. Maybe if it's a $30 game and not $40. @Royalblues lol it cost more than $10 to buy them all separately on the eshop, not saying vc pricing is great but bringing some context. That was the best Mega Man compilation in my opinion! The remixed levels sound interesting but I doubt the game is worth it just for that. I'd go for it if it's like $20 of something but these are nes games, they're basically 40ish minute runs, so you could quite realistically complete the whole thing minus remix in an afternoon. @Jazzer94 well on psn right now you can get 1-4 for a total of $12. I still think that this is one of the most ideotic things they could have done. First: The anniversary collection back on the GC / PS2 was complete. It had every classic era MegaMan game that was out at that point. This one is not only not featuring the more recent MM 9 and 10, its also missing 7 and 8, games that were already on the old collection. Not to mention, they also featured the two arcade games. So, the Legacy collection is worse then the Anniversary one ? Yeah, try to sell that folks. Seriously, in this day and age, whats the big deal of packing every MegaMan game into one, tight package ? MegaMan Legacy: MM 1-10, arcade games, Battle&Chase, possibly even Rockboard and Strategy. MegaMan Battle Network Legacy: MM BN 1-6, Network Transmissio, Star Force, possibly even 4.5 and operation shooting star. Those would be worthwhile packages, all solved through a bit of clever emulation, something theyve done for ages now. This on the other hand, is just lazy beyond believe. @Einherjar I think what hurts too is while I said the remix levels sound cool, in the time it took them to make the remix levels they could have probably just made a new megaman game. So Megaman NES collection? I will pass. I don't get this. The collection is already available via Eshop VC. I guess they figure more people would buy it on 3DS than Wii-U. Really it makes no sense at all. @MikeW I had that too. Somehow, I lost it. I'll have to buy another copy. I loved all of those games. I think iirc, X2 had the Wheel Alligator, which made it my favorite of th X games on the SNES lol. The games in the Legacy Collection aren't emulated. They're being rebuilt from the ground up, akin to the Sonic HD mobile ports. So it's not quite as simple as slapping in a few emulators for half a dozen systems. Although, I do agree that more titles would've been nice. What I would've prefered to do (if Capcom gave me all the money and time needed, which, never seems to happen in the game industry), is create a new engine, and port every classic Mega Man game to that. Think Mega Man: Wily Wars, but in either 2D or 2.5D, MegaMan 1-10 (and & Bass), and maybe even stuff like the Wily Tower, so we could take on the Genesis Unit. And a graphical style that would probably ensure Mega Man looked like his Smash 4 self, which, looks like his regular self. Order now, and I'll port the Game Boy games, absolutely free! This is coming out at the same time as Mighty No. 9. Just you wait and see. Lets see who sells well: Mega Man Legacy Collection or Mighty No. 9? I already got 1-6 when the eShop was doing a Smash Bros character themed sale last year (kind of wish Nintendo would do more first party sales). All the same, this looks like a cool deal if you're a fan or a collector of Mega Man. @WaveBoy: Well, at least its only $15 vs. $30 in V.C. prices. Maybe they will produce more collections if this sells. It looks interesting, but aren't these games already on the VC? 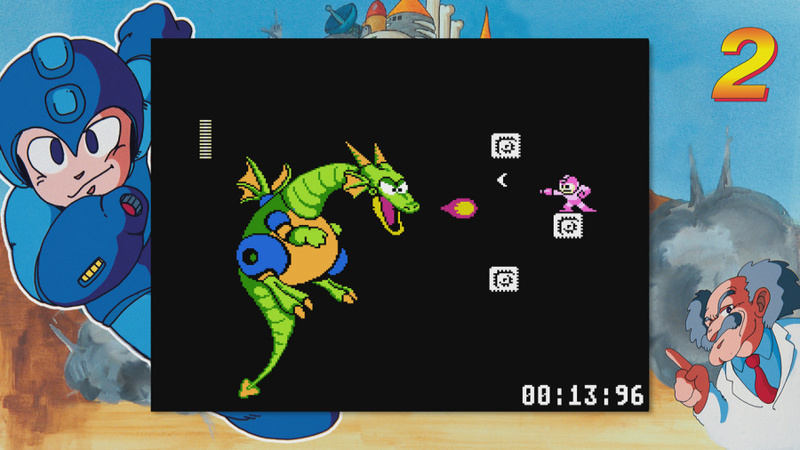 I never had Mega Man as a kid (Sega fan), so I picked up Mega Man 2 when it was on sale on the 3DS. Didn't like it much, but the music was nice. Hahahahaha. Really, Capcom? I'm sorry, but these games are so old, I don't even feel guilty to emulate them. Why don't you create something new for a change? Say, a new Megaman X; I had the trilogy on my SNES, awesome games. They can delay this until the end of time. I still won't buy it. I wanted this for Christmas time oh well. What happened to 7 through 10, Capcom? @Yorumi Just look at the recent Fangames. Unlimited and Rock Force are pretty much up there quality wise. They beat Capcom at their own game, and none of them were Industry Veterans who already had 50+ MegaMan games under their belts, plus they didnt even made money with it. Those custom levels are nothing a ROM hacker couldnt do on a free weekend. NOt that its a bad thing per se, dont get me wrong, but in comparison, its a rather shameful excuse on Capcoms side. They could have done so much more with the same amound of (non)effort that went into this compilation. @DarthNocturnal The thing you are talking about is (was) called MegaMan Universe...and we already know how important that project was to Capcom. To be honest, i dont care if these games are emulated or not. Its not like you can make a great game any better just by recompiling it. And with emulation, you could also enhance resolution, reduce / get rid of flickering etc. No matter which way you look at it, its a poor excuse. I'll still buy it in 2016, Capcom. You're welcome! This is how they killed Mega Man Anniversary Collection on the GBA. Already got 1-6 on the 3ds virtual console, so I'm not interested in this. However, I loved 1-5 and still need to play 6. If 7-10 were also included, this would have been a must buy for me. If these games are being rebuilt from the ground up, then the 3DS version better be in stereoscopic 3D. It's the only reason I'll buy it instead of the two remaining games I need on VC. If it were a collection of Battle Network or Megaman X, I'd be more interested, but this? How many times have they re-released this collection? Thanks for the offer, but I think I'm just gonna go get the Anniversary Collection off of Ebay instead. Releasing this collection without Megaman 7, 8 and Megaman & Bass will be a 180° turn for me. You can play all six NES titles literally anywhere. If they are not there, this collection is pointless, just saying. @XCWarrior I bought the mario clock and pop plus solo 3 times... but never x10 over. at least mario clock is both a CLOCK AND A GAME, and the other one coz bubbles. I have to agree though, even though I don't own this. I saw how people complain about lack of VC or the SMB3 game(back when it took forever to get NA release), yet I have X1 maybe X2 copys of SMB3 and I don't need more. having it on that limited editon wii retail disk is good enough for me TBH, and If I have another it was because of the ambassador program on 3DS.